Fall is the best! I love the whole harvest vibe and the golden colors. I've been dragging my camera to work every day so I can snap photos of the autumn brilliance. Then I left my camera at work and then somehow I downloaded all my photos on to my work computer instead of just the plant pictures. All my food photos were stuck at work. I finally remembered to put my food photos on a jump drive and now I have them my laptop and I can finally share this recipe. Check out these beautiful stuffed acorn squash. They were so tasty I made them twice! I created the recipe as I went along and I wrote down exactly what I did so I could put it up on the blog. I hope you try them. They are perfect for a vegetarian Thanksgiving or really any Thanksgiving. Who am I kidding? This is the perfect meal for any fall evening. What are the acorn squash stuffed with you ask? 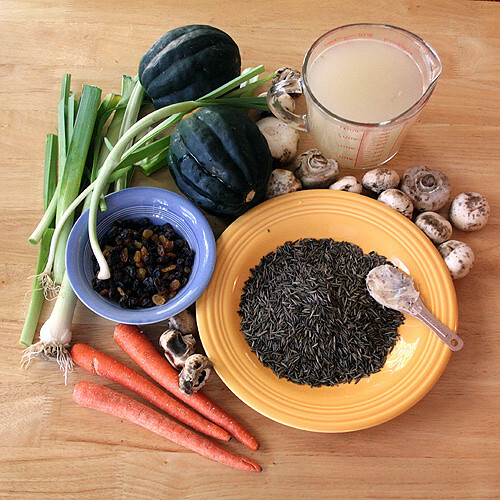 Wild rice, mushrooms, raisins, leeks and carrots. The combination is rich and nutty with some hints of sweetness from the raisins. Zeus, the cat we brought back with us from Panama, loves squash. It's one of his many quirks. I cut these babies open and he was immediately up on the table checking them out. He loves the seeds and the stringy bits. I scooped some into his food bowl so he wasn't licking our dinner, but not before I snapped a photo. Step 1: Over medium heat in a sauce pan combine the broth, salt and wild rice and bring to a simmer. Cover and allow to simmer for twenty minutes. Meanwhile cut the acorn squash in half and scoop out the seeds and stringy part. In a 9x13 pan add 1 inch of water and place the squash cut side up in the water. Bake the squash covered at 400 degrees for twenty minutes. Baking the squash in water will steam it and, added bonus, if the squash releases any juices they won't stick and burn to your pan. Step 2: Clean and cut the mushrooms, leeks and carrots into half inch slices. In a sauce pan over medium heat saute the sliced veggies in the fat until they start to soften. The mushrooms will darken and the leeks will become translucent. It should take about 10 minutes. Step 3: Take the wild rice off the heat and mix it into the sauteed veggies. The wild rice will finish cooking n the oven, so there should still be some liquid left. Stir in the raisins. When the squash finishes its 20 minutes in the oven take it out and drain the water (don't turn off the oven). 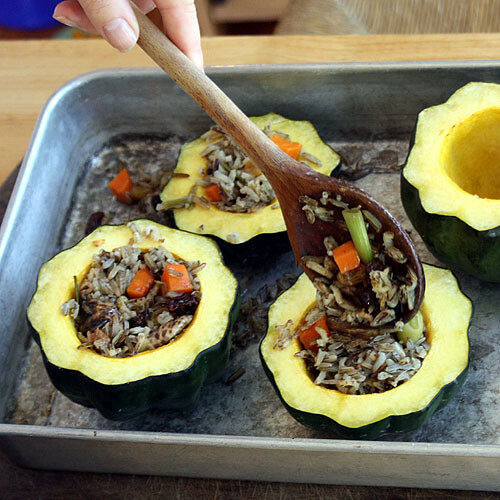 Fill each acorn squash half with wild rice mixture and put the remaining wild rice around the acorn squash. Step 4: Cover the pan and bake at 400 for an additional 30 minutes. Then remove your squash from the oven and let it set five minutes before serving. This dish goes great with green beans or broccoli. Nutrition: 370 calories, 5 grams of fat, 9 grams of fiber and 9 grams of protein. If you are a following Weight Watchers that's just 7 points. I love all the fall foods too! The addition of the raisins sounds so good. I need to try this. 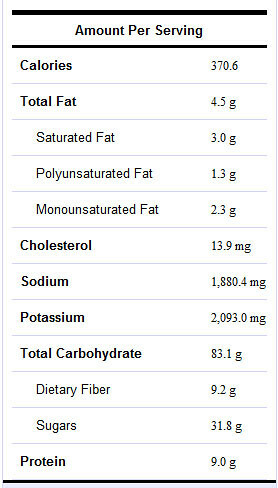 Also, I like the nutrition information. How did you do that? What a perfect fall dinner! I love that your cat likes squash... so funny. Damn! I knew I should have bought some acorn squash at the farmer's market. It looks delicious and I will definitely need to try it sometime. Thanks! This sounds like a wonderful healthy meal. I can't wait to try it! Stuffed Acorn Squash is phenomenal! I recently did a similar meal except stuffed the squash with sauteed veggies, black beans, diced tomatoes, cream cheese, and some cheddar to top it all off. 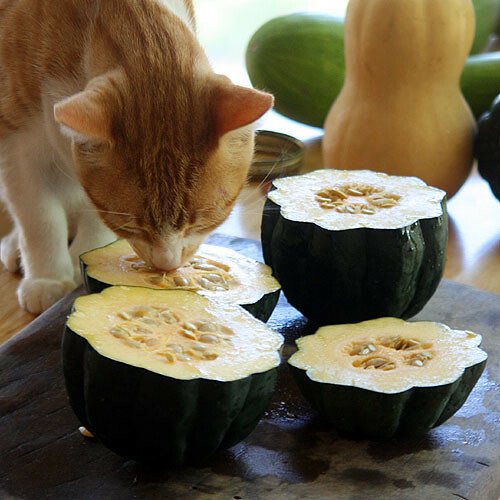 I love the picture of your cat licking the squash - too cute! Oh, and too funny about your kitty, LOL! This looks so awesome! One of my friends has been trying to keep his diet as close to vegetarian as he can, and he loves squash, so I am definitely sharing this with him! Love this recipe. I'll make a vegan version of it, by using the veg. broth & vegan butter. Dasher says hi to Zeus & says he can't wait to try some squash himself! Thanks, K.
simply outstanding. Acorn squash is one of my absolute favorites. I love this recipe. This is one of my favorite ways to use squash. We love the sweet dumpling (both green and orange varieties) for this same purpose. The sky is the limit with what you can put in it! I love everything about this! I think I'd have to really sell it to the kids, but MAN it just looks wonderful and wholesome. It looks like your cat is kissing the squash, cute. Looks like a wonderful, delicious meal! Beautiful photos, too! Thanks for the great recipe! I look forward to fall just for recipes like this one. I love stuffed squash and your version looks delicious. I love the wild rice stuffing, wild rice is so much more nutritious and I love the texture it has. I will absolutely try this one! Looks wonderful and so fall-ish! I have been wanting to try wild rice recipe for a while. I guess I will give this a go. I am definitely trying this recipe. We love squash and always make it in the fall. Is all that sodium (1880 mgs!) coming from the broth?? Lots of love to Zeus!! He's beautiful! That looks delicious! I have some acorn squash on my counter waiting to be stuffed! YUM! (Whoops, typo!) This looks fantastic! Have you ever tried carnival squash? This would be great with carnival squash and they are easy to grow. This looks delicious. Can't wait to try it. Just had breakfast and now I'm daydreaming about lunch! Your cat is so funny! Oh, if you've not shared this at Deep roots At home, I hope you will!!! (I haven't been there today to check). This is amazing..I know we will LOVE it :) Thanks! This looks fantastic. And lovely pics. Love acorn squash. Thanks so much for sharing! This is great! I love your presentation! Thanks for sharing at Foodtastic Friday! 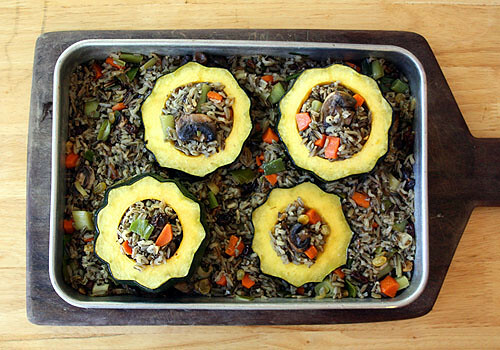 Your Acorn Squash Stuffed with Wild Rice Pilaf looks delicious, a perfect dish for fall. Enjoy your weekend and thank you so much for sharing with Full Plate Thursday. Makes a beautiful dish - color and texture -- and sounds delicious! Thanks so much for sharing on Busy Monday! thank you, my husband doesn't always want the sweet baked squash and this would be right up his alley!